Gardening is about visual beauty, but I believe that plants should excite all of our senses. In my own small garden, I demand not just good looks and a tough disposition; I delight in the bonus of fragrance that contributes an unforgettable dimension. This approach has served me well and I look forward to the stars of each season. The following shrubs are worth seeking out and relishing in a Pacific Northwest garden. I’ve become enchanted with camellias and I believe there is a gardening renaissance awaiting this old fashioned genus. Not only are camellias more forgiving of summer drought than people realize, they offer wonderful flowers at a time of the year when they are needed the most. The fragrance is a surprise in winter, and with the help of diligent breeders, it has been imbued into larger, well-formed flowers. Camellia lutchuensis, a lovely and fragrant species with tiny, white flowers, is the parent that brings perfume to the party. It is, however, the hybrid progeny that really excite the gardener. 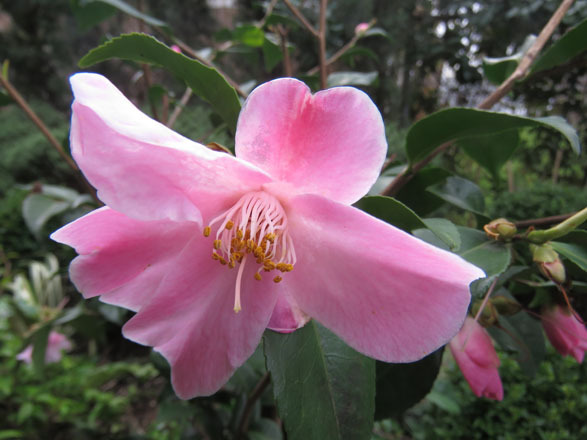 Camellia ‘Minato-no-akebono’ is infrequently available at nurseries, but I’ve had great luck with mail order sources. In my Portland garden, this plant begins blooming in late November and wraps up in late February. Its heady fragrance, a close-up whiff reveals sweet cinnamon with an earthy undertone of moss, is most delicious on days above 50°F. The dainty three-inch-wide, single, rose-pink flowers with fluted petals politely shatter cleanly, never clinging or discoloring when spent. This is a fast-growing shrub that shows hybrid vigor and blooms prolifically. • Evergreen growth to eight feet tall by four feet wide. • Adapts to full shade or full sun; provide regular summer water to establish. • Zone 7a (0˚ to 5˚F). This relatively rare evergreen shrub is not only dapper and restrained in size, it greets mid-spring with a bodacious show of large ivory flowers that emerge from brown velvet-clad buds. As the four-inch wide flowers open, they emit a powerful lemony sweet perfume that is detectable at least 20 feet away on a warm mid-spring day. Sculpted, round, deep green leaves with a subtle layer of brown indumentum are an ideal backdrop to the spring show that continues for up to three weeks. But even then the show isn’t over. New growth emerges and next year’s flower buds ensconced in deep brown fur nestle in each leaf axil on year-old wood. 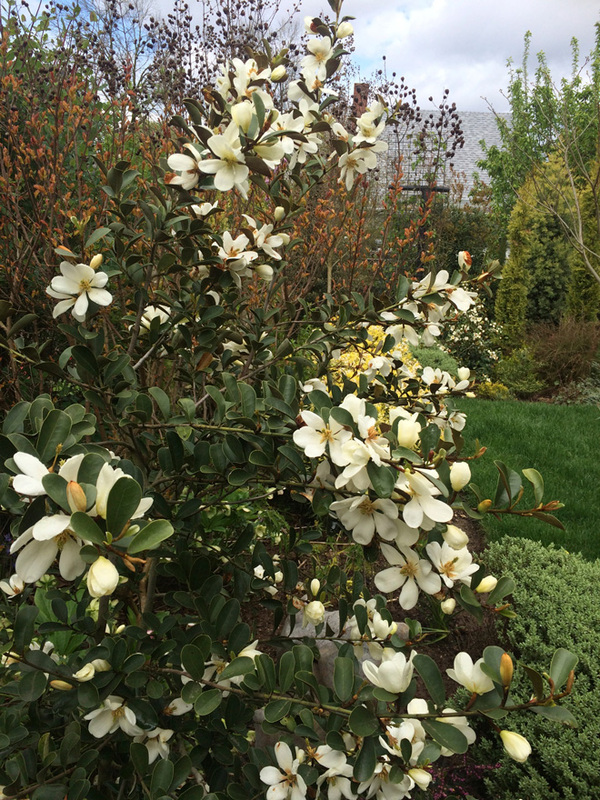 This moderately fast growing shrub, formerly known as Michelia yunnanensis, is always at its best. Be on the watch for new cultivars of this handsome species as several large nurseries are selecting seedlings and developing hybrids with even better characteristics. • Evergreen growth to twelve feet high by six feet wide. • Provide full sun to part shade in average, well-drained soil and light summer water. • Zone 7b (5° to 10°F). I’ve trialed more than a dozen “hardy” gardenias with less-than-stellar results. Either plants that were purported to tolerate extreme cold froze or they would just stall and not grow—languishing and longing for the heat and humidity of the south. Well, this one is the real deal. Gardenia jasminoides ‘Frostproof’ is completely hardy and thrives west of the Cascades. You will thrill at the two-inch, fully double, famously fragrant, corsage-quality flowers for months at a time. 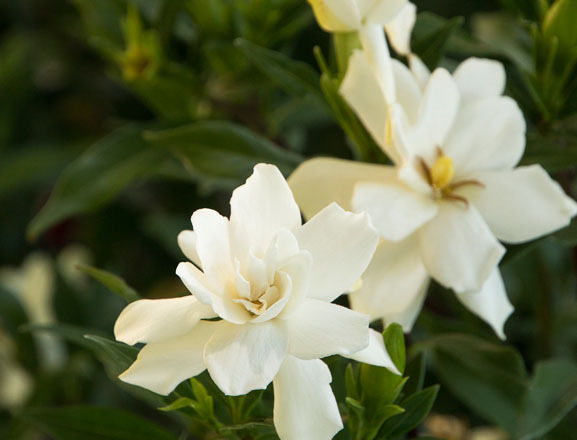 Gardenias are heat-loving beasts, but this cultivar doesn’t need to swelter to get its bloom on. In my Portland garden, it begins flowering in early June after we’ve had a few truly hot days, and during some years it continues to pump out flowers until Thanksgiving. Slow growing and compact, the plant must have rich soil that drains well but retains moisture. It should never be allowed to dry out completely, and after several seasons of robust root growth that will be less of an issue. If you’ve always longed for success and the romance of gardenias, ‘Frostproof’ will not disappoint. • Evergreen growth to three feet tall by three feet wide. • Part shade is best in the Willamette Valley, full sun in the Puget Sound region; provide rich, well-drained, moisture-retentive soil and regular summer water. The more I garden the more I’ve come to appreciate every season. This handsome plant is one of the glories of autumn. From September to November, lacquered green serrate leaves partially hide stems lined with tiny, parchment colored flowers. The blossoms emit a sensuous cologne that is best described as sweet apricot with a heady after note of sharp freesia; a pungent scent that carries from the far reaches of my garden. This fast growing and adaptable large shrub can, with age, achieve tree-like status, but I prefer it as a tall shrub clothed with leaves from the base to the top. 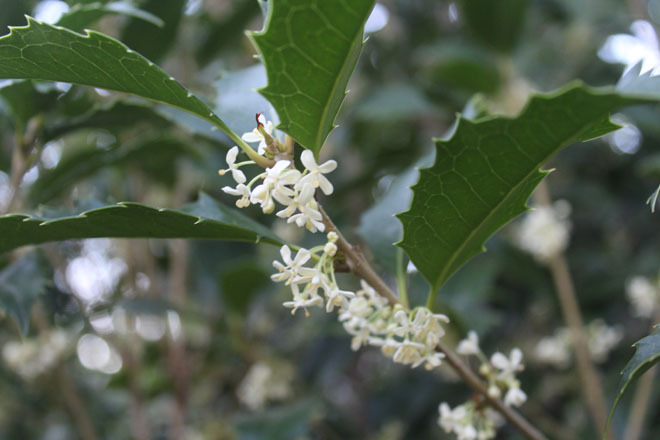 This hybrid between sweet tea olive (Osmanthus fragrans) and holly tea olive (Osmanthus heterophyllus) inherits the perfume of the first parent and the cold hardiness of the latter. This hybrid selection was made at the Saratoga Horticultural Foundation and has been somewhat obscure for years. If you are searching for a screen or large hedge and don’t want to bother with the voracious and weedy cherry laurel this is an admirable substitute. Osmanthus ×fortunei ‘San Jose’ is worth seeking out in nurseries—and an autumn bloom period means it is often overlooked. • Evergreen growth to 16 feet high by 16 feet wide. • Provide full sun to part shade (full sun encourages the most blossoms) and well-drained soil; tolerates regular summer water as well as drought. • Zone 7a (0° to 5°F).